When we talk about wildfires, we usually talk about the well known tinderbox areas of Australia, California, and southern Europe. But, as recent events have shown, fires are a global concern. So much so that we have seen places like the UK (that well known “green and pleasant land”) and places as far north as Sweden burning. These unprecedented events show that nowhere can now be considered ‘safe’ from the risk of fires. For us here at Mazi, this is not just something happening somewhere far away- this is very real and very personal. 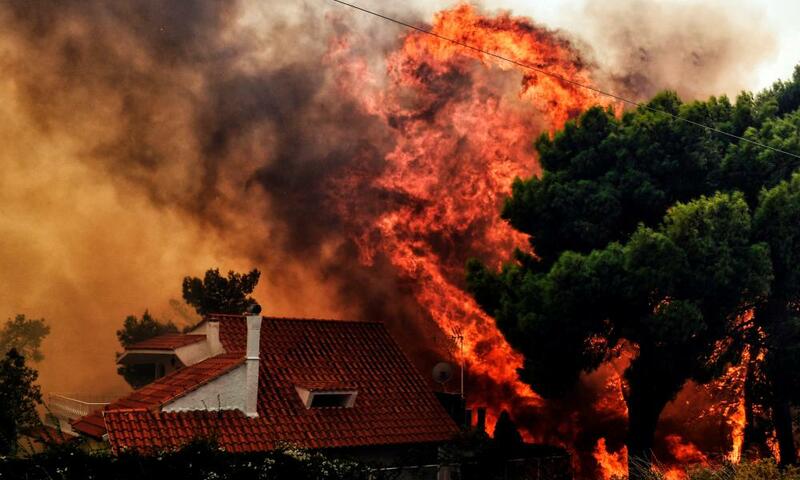 A few weeks ago, Greece saw some of deadliest wildfires ever known to Europe. The tragic fires that happened on our doorstep in Mati shows the seriousness of the situation, and have been a harsh reminder that we are still, and will continue to be, far from invincible to the forces of nature. Currently, every year, fires consume vast swathes of land, and everything else in their path along the way - plants, trees, homes, livelihoods, animals and humans. In windy, dry and hot conditions, wildfires can sweep through landscapes in mere minutes. And their economic and social impacts are felt well beyond their charred edges. That being said, it’s important to recognise that fires are not inherently bad. Like everything else, fires are contextual - in adapted ecosystems, fires play an important ecological role through, for example, nutrient cycling and ecosystem disruption. In fact, they have played a key role in evolution of both our environments and us, with our cultures built around fire and it’s abilities to transform raw food, gifting us with the energy we needed to fuel our development. But in places that historically did not evolve for fire, or in places where fire has become far too prevalent, is it environmentally destructive, releasing vast amounts of carbon dioxide into the atmosphere whilst burning people's livelihoods to the ground. So what do these fires have to do with agriculture? Well, everything. The way we manage the millions of kilometres of land we use to grow our food is key to quelling fires; sympathetic and intelligently managed land is an oasis, whereas poorly managed, degraded land is kindling. Regenerative agriculture works to prevent fire, and/or the detrimental effects of fire, in a number of ways. Firstly, it increases organic matter in the soil. This means two things; better water retention and more quality soil. Organic matter on and in soil is rapidly combusted by fire, therefore reducing the amount of organic matter in the soil. Agroforestry techniques, such as cover cropping, mulching and composting, work to quickly rebuild organic matter in degraded areas which, in the event of a fire, provides a safety buffer of soil organic matter that can be drawn upon, allowing the system to bounce back much quicker. Furthermore, ground-water and soil moisture levels are correlated with fire retardation. This makes logical sense - any would be kindling is wet which, as any ‘happy camper’ in the British ‘summer’ can tell you for free, will not burn despite best efforts. Similarly, soil with high water retention will not burn so easily. Organic matter plays a key role in soil water retention - just a 1% increase in soil organic matter equates to 150,000 litres of water stored in the ground per hectare. Water storage in the soil also means that during dry spells, leaf litter is able to draws up water through capillary action which keeps it from drying out. This is why everything we do at Mazi focuses on soil building, from wood chipping all the organic matter that would otherwise have been burned in the region (check out this video of us for more info) to mulch our land, to our huge compost project we have in the works which will bring life and organic matter to our soil. Secondly, agroforestry works to prevent fire through intelligent incorporation of plants in a diverse polyculture. Intercropping plants and trees with different properties reduces the risk of fire and increases landscape resilience. For example, conifer foliage is notoriously flammable due to the high content of resins and oils. But combining conifer foliage with broadleaf trees drastically reduces the risk of fire compared to a pure conifer monoculture. These fire resistant trees can also be planted as a fire break around plantations for protection, such as the carob trees we are planting here at Mazi. As well as intercropping different fire resistant trees such as we have also incorporated prickly pears into our intercropping strategy which, in addition to helping to prevent fire, also provide a tasty fruit crop. Lastly, in general, trees (specifically native trees) play a key role in fire prevention. Dense regrowth and closed woodlands of native species are promoted as fire protection methods. This works to prevent the intensity of fires by changing the nature of them, for example switching from crown to surface fires. This means that instead of burning the trees all the way to the top creating intense and unmanageable fires (‘crown fire’), only the ground litter is burned which creates the least devastation for the woodland and are the easiest to put out (‘surface fire’). The heat is (literally) on to build a more resilient agricultural system capable of offering practical solutions for our degraded and fire prone landscapes. Farmers may make unlikely firefighters, but agroforestry systems can make a formidable firebreak and I don’t know about you, but I’d say that’s definitely something to get fired up about. Newer PostΓιατι καποιος να ασχοληθει με τους μυκητες ?